I also use this tomato sauce recipe as the sauce in my spaghetti. Preheat the overn to 375. If not using oven-ready noodles - cook the noodles and lay on a towel to dry. In a medium bowl, mix the eggs, ricotta, parmesan cheese, parsley and 1 tsp salt. Cover the bottom of a 9 X 13 pan with a very thin layer of sauce. 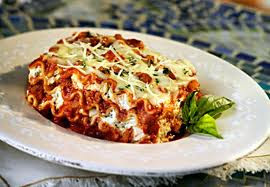 Then layer 1/3 lasagna noodles, then 1/2 of the ricotta mixture, 1/2 of the Parmesan cheese, and 1/3 of the sauce. Repeat. Top with remaining noodles and sauce. Sprinkle additional parmesan cheese over the top. Bake in preheated oven for 30 - 40 minutes. Let stand for 10 minutes before serving.